Unlikely ways to boost your energy after a long night watching the Astros. HOUSTON, Texas (KTRK) -- Y'all, Houston is tired. We can wallow in our sleepiness together. But guess what? We can also try and manage it by downing superfoods that boost our energy, or at least trick us into thinking we're not as tired as we are. Bananas contain a high amount of potassium, which the body needs to convert sugar into energy. Green tea is known to boost energy and mental focus while fighting stress and work-related fatigue. Pumpkin seeds have high-quality protein and minerals that work to boost your immune system. Eating them can promote better sleep. Oatmeal contains quality carbohydrates that provide fuel for your brain and muscles throughout the day. These snacks might help you feel more awake, but let's face it, most Houstonians will turn to coffee. Coffee shops across the city were packed this morning. In some cases, people went right from the bars to get a cup of Joe. "In the last 30 hours? I've probably slept three to four hours," one waitress told us outside Minute Maid Park. "Of course, I had to stop and get my pick-me-up," said another woman leaving Starbucks as the sun came up. A lot of us didn't go to bed before midnight or even 1 a.m.
"That's why I'm here getting a redeye," one man said raising his coffee to cheers our ABC 13 crew in the parking lot. Sleep? What's that? More like, who needs it? Sure, we may have tried to close our eyes, but many of us just couldn't do it. "I think it was the 10th inning that I tried to go to sleep. But then I just watched the game in bed," said another woman carrying a venti latte. That's the thing about earning history, everyone wants to be a part of it. ABC13 is here to help. Feel free to print out this Astros excuse note. Hand it to your boss when you slink into the office late and let us know how it goes. 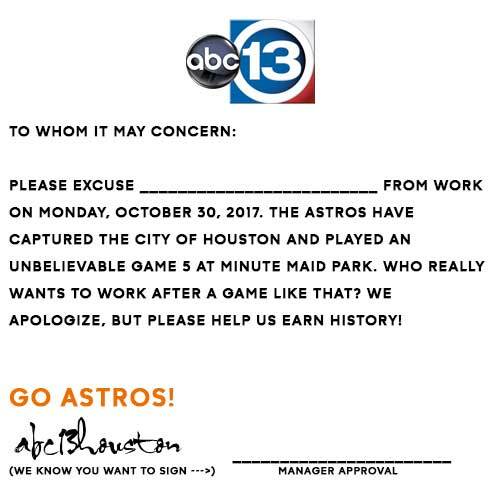 Astros fans can feel free to skip work with this official ABC13 excuse note after the late-night excitement of Game 5.